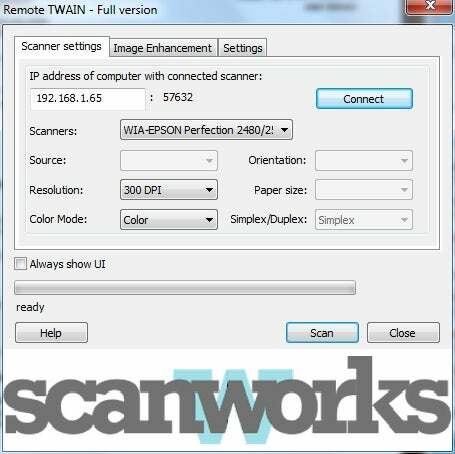 For some reason, Microsoft has never seen fit to implement network sharing of scanners as it has printers--the reason RemoteTwain ($29 for personal use, $59 for business use; 14-day free trial) and similar software exists. If you're scanning a single page, or a multi-page document that fits in the scanner's automatic document feeder (a paper tray for scanners) why shouldn't you be able to scan from the comfort of your own PC and work on other stuff while it proceeds? This scenario is common enough, and RemoteTwain facilitates it. You'll see only RemoteTwain's utilitarian dialog when you want to scan from an application such as IrfanView or Photoshop.